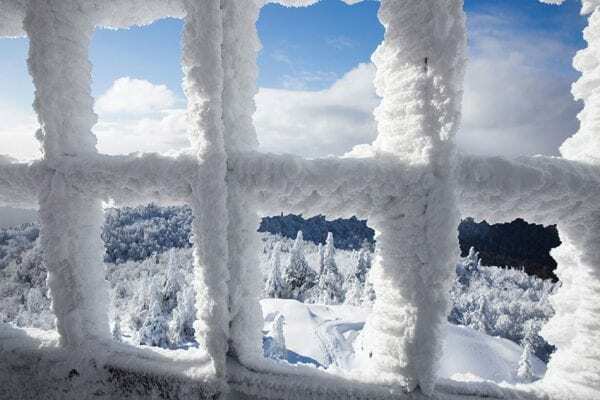 Snowshoers can enjoy a wild panorama from the newly restored fire tower on St. Regis Mountain. 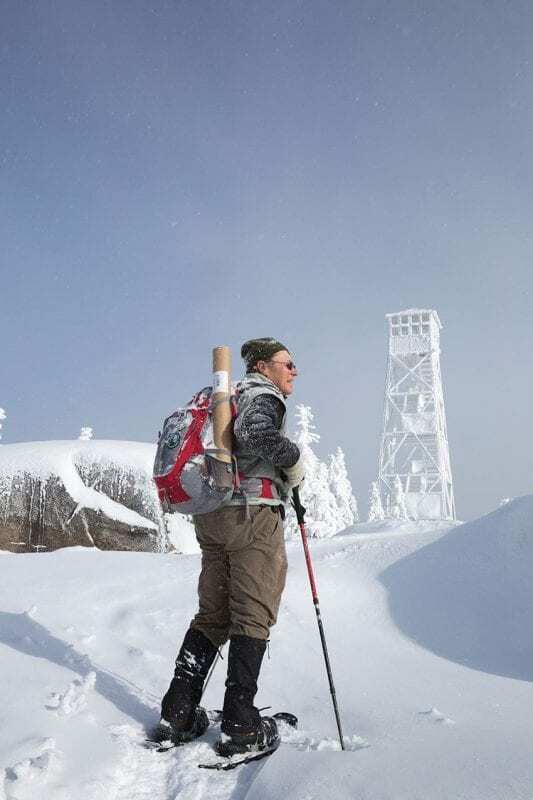 In a photo taken from the fire tower, Doug Fitzgerald crosses the summit of St. Regis Mountain. As we neared the summit of St. Regis Mountain this past January, the conditions changed dramatically. Tree limbs—caked in snow and ice—hung down over the trail, and as we walked crouched through the tangle of branches, snow cascaded upon us. The conditions slowed our travel, but the scenic beauty more than compensated for any inconvenience. The coating of ice and snow on the trees gave them a surreal quality as they glimmered in the afternoon light sneaking through the clouds. We soon emerged from the snow-covered woods onto an open expanse of rock covered by a layer of light snow. 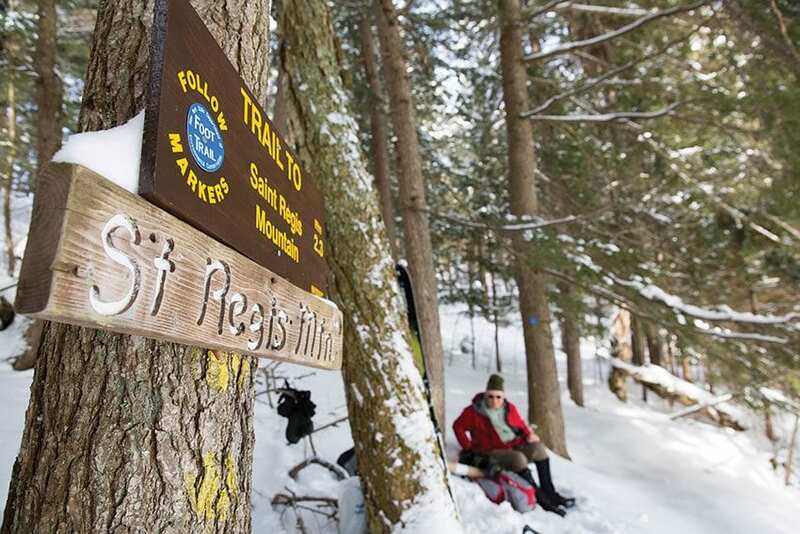 Hikers can thank the surveyor Verplanck Colvin for the spectacular view from the 2,874-foot summit of St. Regis. In 1876, his crew started a fire to get rid of dead trees and brush. The blaze got out of control and burned the vegetation from much of the summit. 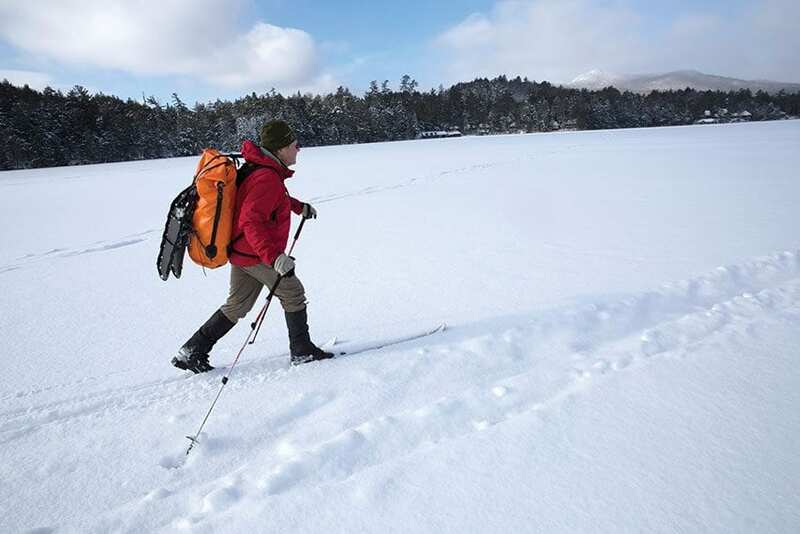 On a clear day, you can see the High Peaks to the south, dozens of ponds in the St. Regis Canoe Area, and larger water bodies such as Lake Clear and Upper Saranac Lake. Doug Fitzgerald approaches the St. Regis fire tower. As magnificent as this sounds, visitors can now obtain even better views from the restored fire tower. It had been closed for many years but was reopened to the public in September, thanks in large part to Doug’s group. After arriving on the summit, Doug took in the vista (which, alas, was partially obscured by clouds) and then headed for the tower and started climbing the steps. The ice on the structure had grown so thick up high that he had to squeeze into the cab. Once inside, he enjoyed views in all directions, including places to the north that can’t be seen from the ground, such as Debar Mountain and Meacham Lake. Doug has been visiting St. Regis Mountain since he was a student at Paul Smith’s College in the 1970s. After graduating, he taught forest recreation at the college. In the summers, he took his students to the mountain to teach them about trail maintenance. He later went to work for the state Department of Environmental Conservation, retiring as an operations supervisor in 2010. In recent years, he got involved with efforts to save the fire tower, which the state once planned to take down. Doug estimates that he has hiked St. Regis more than fifty times, but he had never got to the top in the manner we did in late January. Starting at the public boat launch on Upper St. Regis Lake, we skied roughly two miles across the lake to the west shore. Often, skiing across the frozen lake is a breeze, but we had to deal with ankle-deep snow on top of partially frozen slush. We tried skiing in icy snowmobile tracks, but they were too uneven. On the plus side, we had wonderful views of St. Regis Mountain and of rustic Great Camps along the shoreline. We also saw a bald eagle. skis Upper St. Regis Lake. Apart from being passed twice by a lone snowmobiler, we didn’t see any people. That’s not surprising as most of the residences on the lake are closed during winter. On our way back, at sunset, we noticed only two homes with lights on. One belonged to Jim Cameron, a boat-builder whom I visited last summer for an article about makers of traditional Adirondack guideboats. As we approached the far end of the lake, we skied on the north side of Ward Island and entered Averill Spring Bay. There we picked up the Teddy Roosevelt Trail, a route used by paddlers in other seasons. The trailhead is a bit hard to find, but there is a small dock jutting into the water and a sign a little into the woods. The sign and blue trail markers were installed last fall by DEC. Here, we switched to hiking boots and snowshoes, leaving our ski boots and skis behind. From this trailhead, it’s about 2.3 miles to the summit. We had to break trail for about a mile until reaching the main hiking path that starts from Keese Mills Road. If you start from the main trailhead, the round trip is 6.6 miles. Our round trip, including the ski, was about nine miles. Though our route is longer, it offers greater variety and more scenery. Just be sure the skiing conditions are satisfactory. Wooden signs mark the start of the Roosevelt Trail. At the outset, the Roosevelt Trail climbs steeply up an esker (a sinuous glacial deposit) and soon reaches a junction with a side trail. 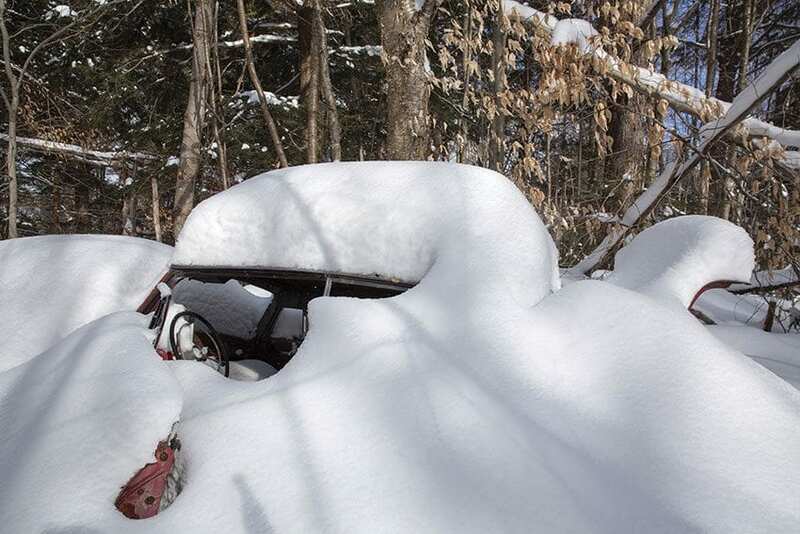 You bear left here to reach the hiking trail from Keese Mills Road, but we went right, taking a detour to find an old car, covered in snow, sitting in the woods, just a few hundred feet from the junction. We returned to the Roosevelt Trail and continued hiking to the main hiking trail, where we turned left. For most of the way to the summit, the trail passes through a hardwood forest. Toward the end, it gets fairly steep. At this higher elevation, you’ll notice more evergreens as well as more birch trees. After wildfires swept through the Adirondacks in the early twentieth century, the state stationed a fire observer on top of St. Regis starting in 1910. The fire tower was built in 1918 and staffed until 1990. It is now on the National Register of Historic Places. 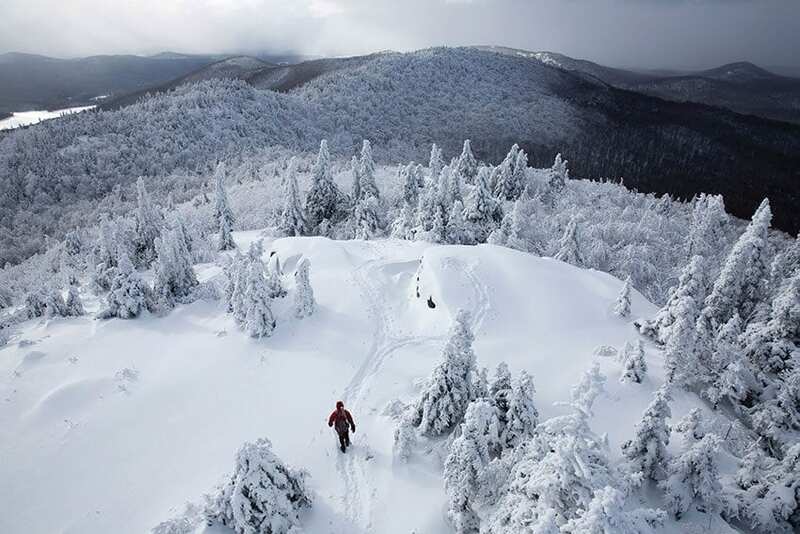 In 2010, the Adirondack Park Agency said the towers on both St. Regis and Hurricane mountains were in violation of the Adirondack Park State Land Master Plan and should be removed. After a public outcry, the APA reversed course and classified a half-acre on both summits Historic Areas, a designation that allowed the towers to remain. However, officials said the state wouldn’t foot the bill to rehabilitate the towers. That would be left up to volunteer groups. Friends of St. Regis Mountain Fire Tower raised money and came up with a rehab plan, which was approved by DEC, and work began in 2015. Over the past two summers, the friends’ group partnered with the Adirondack Architectural Association on plans, and worked with the Student Conservation Association and DEC to fix up the cab and replace its roof and the stairs leading up to it. Ice encrusts the inside of the tower’s cab. Doug says there is still a lot of work to do. The cross-braces need to be replaced, which will likely cost more than $15,000. The group is also looking to continue the fire-tower steward program. Last summer, the friends partnered with the Paul Smith’s College Adirondack Watershed Institute to put a steward atop the mountain one day a week to provide visitors information about the tower and the landscape. They also plan to install panels inside the tower with panoramic photos that identify key landmarks within view. Friends of St. Regis Mountain Fire Tower has a core group of five people and about twenty others who volunteer their time. “We’re far from done, and we’re looking for help,” Doug said. Despite long days of work, including hikes at both ends, Doug has no regrets about signing up. He recalled being blown away by the view last September while installing railings on the last flight of stairs beneath the cab.